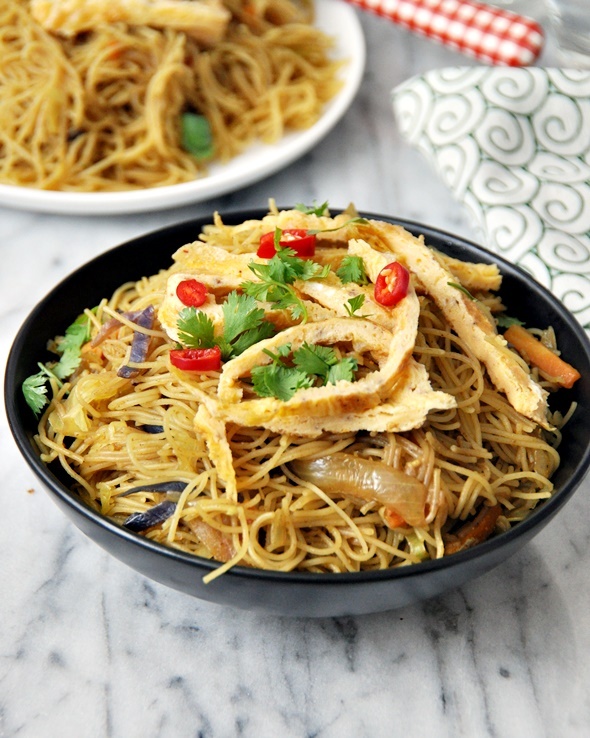 I mainly cooked with fresh Hokkien noodles and the dried rice vermicelli noodles (bihun) at home and some of you may already have come across my Hokkien noodles previously. 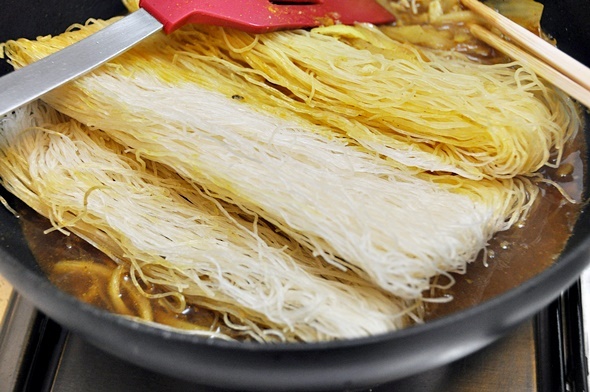 When it comes to cook with dried rice vermicelli noodles, there’s only one way I would do it: absorption method as featured here. This way, you don’t have to worry about softening the noodles in a separate bowl and they turned out to be much more flavourful because of absorbing the seasoned liquid. The last time I featured the one-pan rice vermicelli noodles dish, I was recreating my childhood favourite called the “Economy noodles”. The reason for its name was because it was a very affordable street food in Penang. I remember I used to pay like an equivalent of AUD $0.30 a packet twenty years ago. 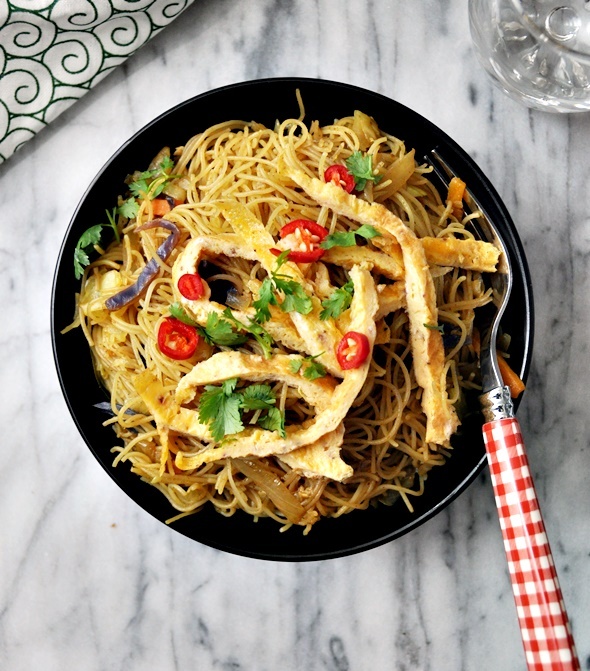 Today, I am re-creating another favourite of mine called the Singapore noodles. For those who are noodle lovers or regular Chinese take-out patrons, I bet you’re no stranger to this flavourful curry spiced noodle dish. I usually like my noodles quite plain so you may notice that my version is just with vegetables topped with omelet. I was back from work really late and decided made this in a large batch with a packet prepacked coleslaw salad (to save me the effort of chopping vegetables). But if you prefer to add more protein into this dish, feel free to add chicken, beef or seafood. To make the omelet: Whisk eggs, salt and pepper until well mixed. 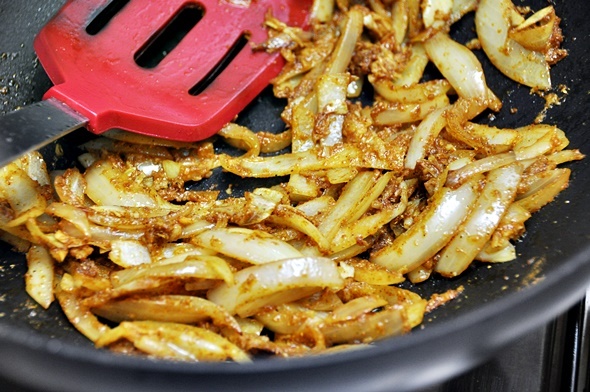 Heat some oil in a pan and when the oil is hot, add the egg mixture. 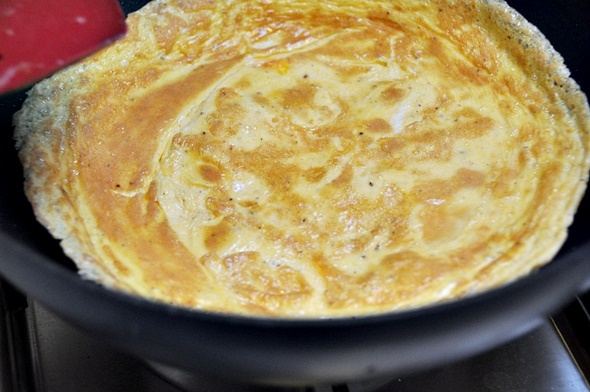 Cook over low-medium until 80% cooked and flip the omelet to cook the other side. Set aside on a plate. When it is cool to handle, slice the omelet thinly. 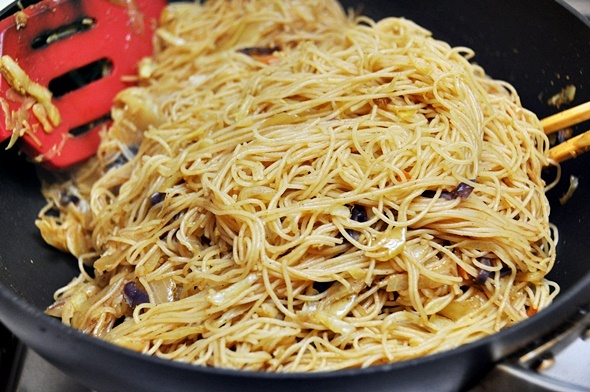 To make the Singapore noodles: Add about 4 tbsps of cooking oil and sliced onion in the same large pan and saute over low-medium heat until translucent. Add and saute garlic, ginger and curry powder over low heat until aromatic. Add a small splash of hot water if the mixture appears dry. Add soy sauce and allow it to sizzle for about 5 seconds in the pan. Then pour 4 cups of boiling water. Stir to combine and wait until the “broth” starts to boil. When the broth is bubbling, add the dried rice vermicelli noodles. 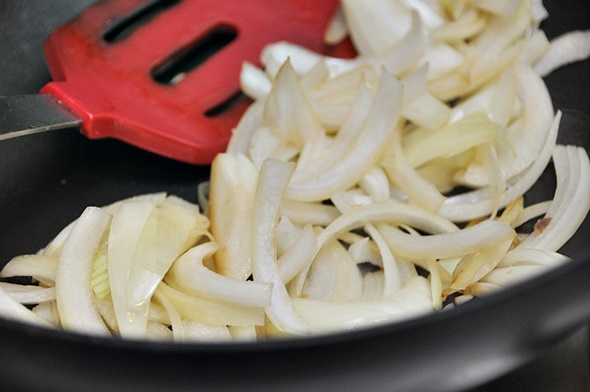 Using a tong, toss the noodles around in the broth until all are absorb evenly over medium heat. 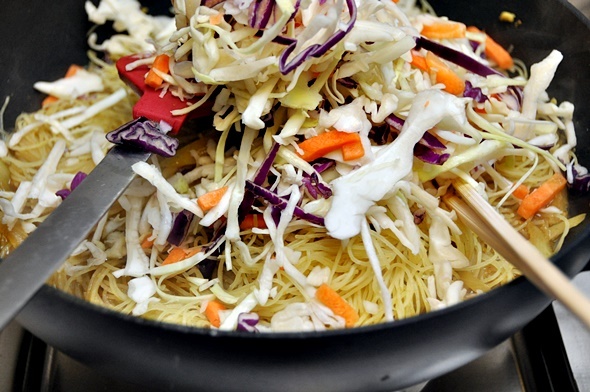 When the noodles are loosen, add coleslaw salad and toss evenly with the noodles. Keep tossing the noodles until all liquid has been absorbed. If you feel the bottom starts to stick a little, reduce the heat to low. Check for taste. Add more soy sauce if necessary. When the noodles are done, turn the heat to high and toss for a couple of seconds. Garnish with sliced omelet, chilli and fresh coriander just before serving. Another awesome recipe! We’re trying this soon! I agree with you about the absorption method. It’s the best way to go with bihon noodles. Been wanting to try Singapore noodles forever and now I won’t be satisfied until I have some. Yours looks perfect! Haven’ t tried cooking vermicelli noodles using the absorption method before but it makes sense that they’d be much more flavourful. Great tip! This looks great! I’m a bit confused by the absorption method though…so the noodles will just absorb all the liquid and not get soggy? Can this work with any Asian noodle?